Harter Glenn Hudson loved his family and the High Sierra. 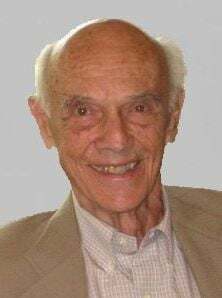 After a long and energetic life, he passed away quickly and peacefully on Wednesday, October 24, 2018. Harter was born in Woodland, CA. After attending San Leandro High School, he started Stanford University at age 16. The U.S. Navy sent him to U.C. Berkeley in 1944, where he graduated in 1946. He returned to Stanford for his Masters in Industrial Engineering, which he received in 1949. He worked for Owens-Illinois, Inc. for 35 years, and he took great professional pride in computerizing its West Coast operations in 1960. His heart was always in California, even when his job temporarily moved his person to Ohio from 1973 to 1986. He found his greatest peace in the spectacular blue-gray granite and pristine water, sky and air of the High Sierra, which he joyously shared with his family and anyone who had the spirit to trek with him. He could repair almost anything. In retirement he took up woodworking, where he built numerous beautiful, meticulously crafted solid wood large furniture pieces and accessories for family, friends and several Napa Valley community buildings including the Sharpsteen Museum and Rianda House. He enjoyed golf and volunteering for several Napa Valley land preservation and historic organizations. He took his last pack trip at age 84, and continued to build trails with Volunteers for Outdoor California until age 90. He would drop everything to help or be with family. Harter is survived by his three children and their spouses, Bill Hudson (Pat) of Orinda, Eliot Hudson (Mary Martha) of Lafayette and Elizabeth Hudson (George Doddington) of Walnut Creek, and by his grandchildren, Zachary Hudson Stewart, Vanessa Eliot-Hudson Stewart, (Karthik) Christopher Hudson (Jem) and Parke Hudson (Cindy); and by great-grandchildren Ava Vanessa Karthik and Tara Vanessa Karthik. He is preceded in passing by his wife, Elaine, his parents William Urquhart Hudson and Ruth Harter Hudson, his brother Larry, and his sisters Ann Larsen and Nancy Kenfield. He remained friends with his first wife and mother of his children, Alice Schofield of Walnut Creek. A celebration of Harter’s life will be planned for family and close friends. We like to think he is ascending his beloved mountains now.